A new site for ordering my designs has now been launched. The following patterns AND MORE are now available to purchase at my new site, using a Paypal shopping cart, or order by mail. All patterns now available as PDF file downloads. 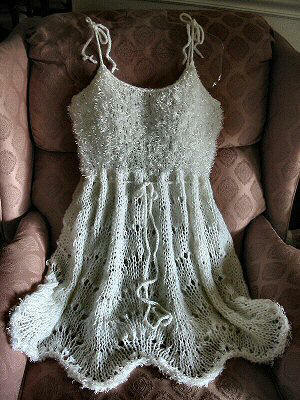 A simple to knit, yet sophisticated looking nightgown. Soft for sleeping or lounging, with a graceful, flowing skirt, adjustable waist, and loosely knit eyelash top that easily adapts to different widths. Due to the loose knit of the fabric and natural give of the eyelash yarn, top sizes will adapt to different widths, since it can stretch out widthwise, or pull down lengthwise making it narrower in width, when worn. Waist size is very adjustable with center tie. 400 (500) yards soft, worsted weight yarn (more if longer skirt is desired). This baby blanket is also a handy wrap-up bunting with an attached hood, and sides that are secured by a bottom “flip-forward” pocket. When not being used as a bunting, the blanket can be used as a conventional flat baby blanket. It features a center back hole for easy car seat belt use (works well on most safety seats, but the 5-point harness systems that have the side leg straps are a bit more difficult to work the straps over the sides of the blanket). Written with detailed instructions in line-by-line format, suitable as a newer knitters project, while having enough detail to interest more experienced knitters as well. Generously sized for larger than newborn size, to allow for continued use as baby grows. Finished measurements: 36” wide unfolded flat; 22” long on body sides; 26” total length from top of hood to bottom. Bottom Pocket: 12” wide by 6” deep. Approx 750 yards smooth Worsted Weight Yarn. Sample knit with Plymouth Encore, worsted weight, 75% acrylic/25% wool, 3.5 oz (100 gr), 200 yards (183 meters), 4 skeins. 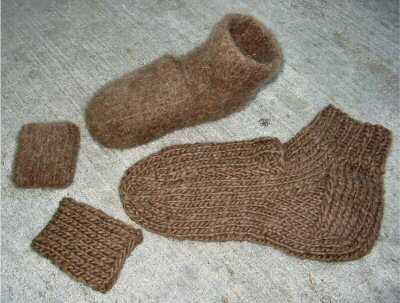 Adult small to large, depending upon how much felting is done after slipper is knit. A sock pattern of tricks for shaping stockinette stitch socks for a better, snugger fit to hug your legs and your ankles, but without interrupting the stitch pattern of the self-patterning sock yarns. Features special ankle stitch shaping and graduated top ribbing. A unique concept for those great patterned sockyarns! 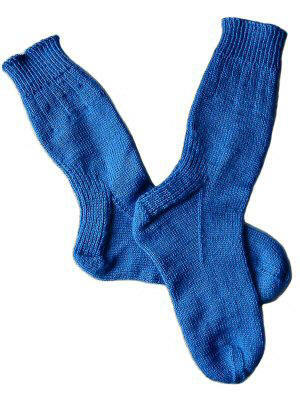 Using ribbing in your socks doesn’t have to be boring! These socks incorporate 3 steps of ribbing in their design. First, the custom ribbing on the cuff is designed to flow into the lines of the Popcorn and Lace Rib pattern on the leg. Then this simple combination of stitches is both functional and decorative at the same time. The ribbed structure provides a good fit by stretching for many leg sizes, while the easy popcorns and eyelet lace add visual interest. Finally, the popcorns are eliminated on the foot where the bumps might feel uncomfortable in a shoe, while the eyelet lace rib is continued seamlessly down the foot for a fine fit with fancy looks. Also currently available in the 2006 Knitting-Pattern-A-Day Calendar, by Accord Publishing, September 6th page, while supplies last in stores! 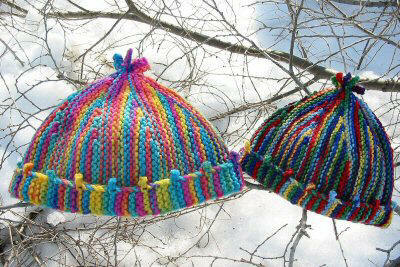 A baby or toddler sized hat knit sideways, with fun popcorn edged cuff and top fringes knit on as you go! 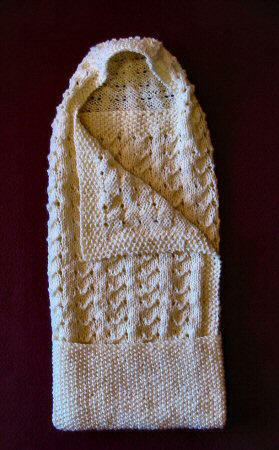 The only finishing is a final seam of cast on to bind off edges. (A provisional cast on may be used instead, and edges grafted, if a seamless hat is desired). 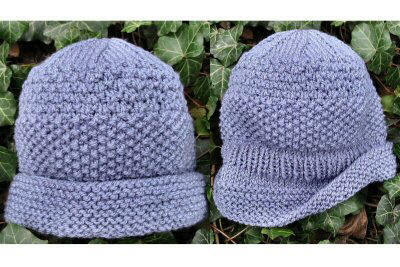 Both sizes of hat use the same instructions, the size is determined by yarn and needle sizes. A simple to knit hat, worked in the round, or flat and sewn, with a hidden ribbed band under the turned up cuff that helps the hat fit, and stay on. Also looks wonderful in color-changing yarns, especially Noro's Kureyon and Silk Garden, or with the sections knit in different solid color bands. For those who can't wait for this to come out in Fall of 2006 in the 2007 Knitting-Pattern-A-Day Calendar, by Accord Publishing, it can be also be ordered directly from me now. 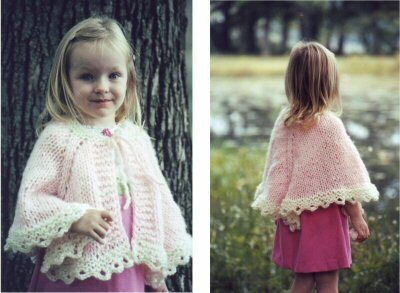 A little girl’s cape with lots of room for movement and play, that is quick to knit using chunky brushed yarn that also gives lots of body and warmth. Worked top-down with easy shaping, and a simple decorative crochet scallop bind-off that gives extra-cute girl appeal. A standard bind-off may be substituted if desired. Chunky weight brushed acrylic mohair-look yarn, two colors. Main color: 135 yards / Contrast color: 65 yards. Sample knit with Lion Brand Jiffy 100% acrylic, 3 oz/85 grams, 135 yards/123 meters. Rose pink, 1 skein; Fisherman, 1 skein. © 2006 All text and photos on this site are property of Dawn Adcock. Do not use any content on any other website or printed material, or in any other way, without written permission of owner.